Topsfield Town Hall is located at 8 West Common Street, Topsfield, MA 01983; phone: 978-887-1500. Photo: French-Andrews House, ca. 1718, 86 Howlett Road, Topsfield, MA. Listed on the National Register of Historic Places in 1990. Photographed by User:John Phelan (own work), 2010, [cc-by-3.0 (creativecommons.org/licenses/by/3.0)], via Wikimedia Commons, accessed February, 2014. Topsfield was originally part of Ipswich and Salem. The locality was called by the Indians Shenewemedy, and was the home of one of the clans of the Agawams. The first English settlers called it New Meadows, probably on account of the extensive tracts of meadow land in its immediate vicinity. The English residents came here as early as 1635. The very first settlers were Allan Perley, an emigrant from England, and ancestor of the Perley family in America; William Towne, an emigrant from Bristol, England; Alexander Knight; Zaccheus Gould, from Hemel Hempstead, England and ancestor of most of the American Goulds ... among dozens of others. The first notice of Topsfield is contained in an order of the General Court, dated July 4, 1639. By this order certain lands lying near the Ipswich River were granted for a village to the inhabitants of Salem. Although by this order Salem people alone had lawful authority to settle there, several families in Ipswich made their homes with the settlers from Salem. Most of the early settlers lived on the north side of the river. On the south side the meadows stretched away for a long distance; some of the upland was under cultivation, but most of it was covered by the "Salem Woods," when Topsfield had been settled for just a few years. 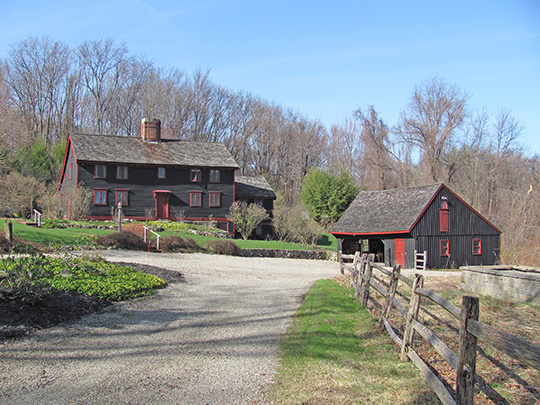 The General Court declared, October 18, 1648, that "the village at the new meadows at Ipswich is named Topsfield." The population increased, more houses were built, and the little hamlet of a few cottages had become a settlement of some consequence by the time the General Court granted it a town charter in October, 1650. The town was called Topsfield, probably from Topesfield, a small parish about 4 miles west-northwest from Castle Hedingham, in Essexshire, England, though no reason is known why that name should have been selected, unless some of the early settlers came from that place in England. Hamilton Hurd, History of Essex County, Massachusetts, Volume II, J. W. Lewis & Co., Philadelphia, 1888.